A 2005 report by the Durango-based Oil and Gas Accountability Project (OGAP) found that fluids injected underground in hydraulic fracturing operations have been linked to a variety of health problems including respiratory illness, cancer and birth defects. In hydraulic fracturing, companies inject fluid under high pressure to break open rock formations allowing more natural gas or oil to flow up the drilling tube. Companies also inject acid to dissolve the rock to increase the flow of natural gas or oil -- a process known as "acidizing" or, if the acid is injected under high pressure to fracture the rock, "acid fracturing." In addition, companies inject "proppants" such as sand to prevent the fracture from closing (Oilfield Review 1995, OGAP 2005). OGAP found that a draft EPA study showed that even when diluted with water, companies may inject at least nine fracturing chemicals into underground drinking water sources at concentrations that pose risks to human health: aromatics, benzene, ethylene glycol, fluorenes, methanol, 1-methylnapthalene, 2-methylnapthalene, naphthalene and phenanthrenes. The EPA removed this information from its final study released in 2004 which found that fracturing "poses little or no threat" to drinking water. An EPA insider and others subsequently criticized the study's accuracy. OGAP also found that one fracturing company, Schlumberger, recommends that many of its fracturing fluids be disposed of at hazardous waste facilities (OGAP 2005). In the Energy Policy Act of 2005, Congress exempted the practice of hydraulic fracturing from the Safe Drinking Water Act. The oil and gas industry is the nation's only industry that is allowed to inject hazardous substances unchecked directly into, or directly adjacent to, underground drinking water sources (OGAP 2005, Hartman 2007). The use of large volumes of injection fluids also raises questions about whether the water required for such injections may exhaust scarce water supplies in Colorado and other western states. According to records from Englewood-based IHS Energy, Delta Petroleum Corp. injected a natural gas well in Mesa County with one of the highest volumes of fluid in the state. Between April 14, 2007 when Delta drilled the well and November 6, 2007 when drilling was completed, the Denver-based company injected the well with 1.4 million gallons of unknown fluids and acid and 361 tons of sand (IHS 2008). The records also show that between February 3, 2004 and June 28, 2004, Canada-based Encana injected a natural gas well in Garfield County with 1 million gallons of fluid and 454 tons of sand (IHS 2008). The numbers are consistent with a 1995 report from the industry publication, Oilfield Review, which found that companies can inject wells with as many as 1 million gallons of fluid and 1,500 tons of proppants such as sand (Oilfield Review 1995). Victor Carrillo, a representative for the Interstate Oil and Gas Compact Commission, told Congress in 2005 that 90 percent of the United States' oil and gas wells are fractured (Carrillo 2005). Overall, the IHS records show that there are 9,037 wells in Colorado that received 431.7 million gallons of treatments with fluids. Most of the treatments are listed as fracturing or acid treatments (IHS 2008). These figures likely understate the total number of wells treated and the gallons of fluid used. 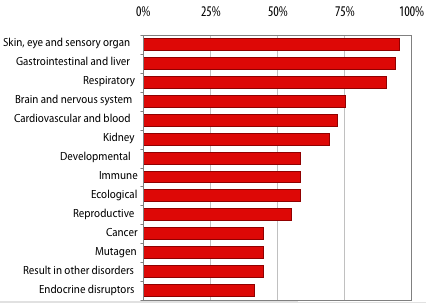 Percent of 65 chemicals associated with adverse health effects. Source: The Endocrine Disruption Exchange 2008 Analysis of Chemicals Found on National Toxics Lists for Colorado, unpublished. Source: The Endocrine Disruption Exchange 2008 Analysis of Chemicals Used in Colorado Natural Gas Drilling Operations; Environmental Working Group Analysis of CAA, CWA, CERCLA, EPCRA, RCRA, and SARA. At least 65 chemicals used by oil and gas companies in Colorado -- including at least some used for chemical injections -- are listed as hazardous under sections of the Clean Air Act, Clean Water Act, Comprehensive Environmental Response, Compensation, and Liability Act (CERCLA), Emergency Planning and Community Right-to-Know Act (EPCRA), Resource Conservation and Recovery Act (RCRA) and the Superfund Amendments and Reauthorization Act of 1986 (SARA). The chemicals are associated with a range of health effects from skin and eye irritation to nervous system and brain problems. Of those chemicals that appear on the federal toxic lists 95 percent can cause skin, eye, and sensory reactions; 90 percent have respiratory effects that include asthma, sore throats, and chronic sinus and upper and lower respiratory infections; 75 percent affect the nervous system, causing headaches, unexplained tingling, numbness and pain in the extremeties, blackouts, and convulsions; more than 70 percent can cause more long-term effects such as cardiovascular, kidney and immune system disorders; and approximately 45 percent are associated with cancer. The Endocrine Disruption Exchange identified the chemicals and other substances used in oil and gas drilling through Tier II reports that companies are required to file with emergency first responders under EPCRA; Material Safety Data Sheets (MSDS) that companies are required to file with first responders by the Occupational Safety and Health Administration (OSHA), environmental impact statements written by the Bureau of Land Management and Forest Service; and accident reports completed by first responders (TEDX 2008). While these data sources provide a glimpse of the chemicals used by energy companies, the sources are incomplete. Companies sometimes list names of products described in general terms such as "plasticizer" or "crosslinker." Data on the products' chemical ingredients is often missing. Sometimes product labels state "proprietary." The documents do not reveal -- nor are they designed to reveal -- what volumes or concentrations of the chemicals are used in the drilling and fracturing process. The MSDSs are designed to protect employees and first responders in the case of an accident and focus on acute exposure, but the information on the sheets often does not reflect the health impacts from long-term exposure.